I would never have believed that sweet potatoes and bananas go together. But they do. Try this delicious recipe on Thanksgiving. I think your family might like it. Preheat the oven to 400 degrees F. Prick the sweet potatoes all over with a fork, put them in a roasting pan and roast for 30 minutes. After 20 minutes, add the bananas to the pan. Continue roasting for 10 to 15 minutes until both the bananas and potatoes are very soft. Remove the pan from the oven but don’t turn the oven off. When the potatoes are cool enough to handle, scoop out the flesh into a large mixing bowl. Peel the bananas and add them to the sweet potatoes. Beat vigorously with a mixer or with a wooden spoon. Spoon into a baking dish. Top with crumb topping if desired and bake til topping is golden brown. Rub the butter into the flour with your fingers. Add pecans, then sprinkle over sweet potatoes. If you taste this and think it needs to be sweeter for your family, just go ahead and add rapadura, brown sugar or maple syrup to taste! 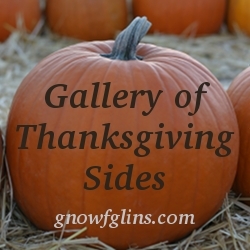 I’m sharing this recipe in Wardee’s Gallery of Thanksgiving Sides at gnowfglins.com ~ visit the Gallery to see more real food Thanksgiving side dishes! Pingback: Getting Ready For Thanksgiving! Ah….. then you are obviously not the banana hater, grasshopper… :o) Maybe you could make it for your mom for Thanksgiving! We tried this recipe of yours two years ago. We all liked it. Well, except for one person who’s not big on bananas. The rest of us thought it was AWESOME! This looks so delish!!!! I can’t wait to try it…. What an interesting combination. I’ve never had sweet potatoes and bananas. I’ve never cooked a banana for that matter 🙂 I have to admit that it sounds very good! I hope you will try it some time. Maybe not Thanksgiving, because wouldn’t it be terrible to make a big bowl of it and not like it??? I was skeptical the first time I tried it. But wow, I really liked it and my family did too.